When I try to look ahead to 2016, I am immediately struck by what seems a contradiction, opposite sides of the same coin. In Lincoln we will be celebrating the centenary of the engineering achievement of the tank. We will be also welcoming refugees from the war in Syria. There will be much more; each of us looks forward to or, sadly, dreads something that the new year will bring. I just want to dwell on the contrasts of the tank and the refugee. I came across a story of the origins of the tank in the surprisingly good book by Boris Johnson, The Churchill Factor. This is very much Johnson’s personal view of the great war time leader. Churchill is without doubt Johnson’s hero, but not in all things; Churchill was after all a fallible human being. But the tank is a place where Johnson definitely sees Churchill as hero, compassionate hero. Unlike many of today’s politicians, many in both the first and second world wars had first hand experience of the horrors of fighting. Churchill had seen many thousands of young men go to their death as they went ‘over the top’ into a hail of machine guns bullets. Churchill observed that whilst mankind had invented a means of destruction, they had not yet provided an effective defence. What was needed was a shield, but one that could move over rough ground and so protect our boys. They needed a land ship, something out of HG Wells. Churchill, as First Lord of the Admiralty, knew the men who could do the job and so the idea was born. Others, more expert than I, can tell of how the idea evolved into the tanks manufactured on Tritton Road. I have explored the further evolution of the tank during the second world war as part of my research for my forthcoming book, War on Wheels, on the mechanisation of the army. There is much that has struck me, but the strongest point is surely how destructive this means of defence became. My son spent some time in Damascus a few years ago and told me of the incredible beauty and long history of Syria. Much, indeed most, of the physical history and great architecture of that ancient civilisation has now gone. The tank was but one weapon taking part in that destruction, far more so of innocent people than stone and mortar. Nonetheless it did destroy. When the refugees arrive in Lincoln they will see the monument that has been created to remember those who invented and built the tank. We can tell Mr Churchill’s story. We can emphasise the engineering skill and involvement of so many people in confronting a nation with cruel ambition. 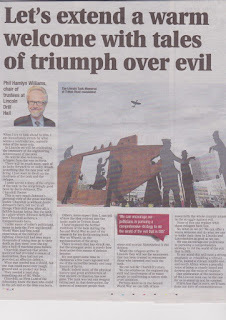 Perhaps more so in WW2 we can talk of how essentially the whole country joined in the struggle against evil. None of this can replace what those refugees have lost. So, what do we do? We can offer a warm welcome and do what we can to make their lives in Lincoln and Lincolnshire as good as we can. We can encourage our politicians in pursuing a comprehensive strategy to rid the world of the evil that is ISIS. To my mind this will have a strong emphasis on rebuilding a vibrant Syria, indeed a vibrant middle east and north Africa where a peaceful voice of Islam is clearly heard and drowns out the voice of violence. Perhaps our celebration of the centenary of the Lincoln tank can be the cue for us to stand up and be counted. If 2016 has that in store, we’ll have done our duty of commemoration. I waited for the pearl of wisdom. This conversation took place some years ago now, but I recalled it on two occasions recently. The first was a gathering of over one hundred people who had come together to plan our response to the arrival in Lincoln of the first refugees from Syria, something we are calling #CompassionateLincoln. We talked about collecting clothing and household goods; we explored the possible problems that refugees might face. We began to plan a fundraising event and someone said, “this is what churches used to do.” In the conversation that followed, it became clear that many there had been brought up with the church as part of their lives, but that they had long since stopped attending. My suspicion was that that early church going may have given us all that sense of concern for our fellow human beings that had brought us all together. But there were others there, probably most, who had no history with the church. My colleague who had identified the ‘problem with the church’ would argue that christian teaching over centuries had entered the blood stream of the nation and so we all have, or can have, that sense of christian values. This is dangerous territory since atheist friends would take issue and point possibly to some shared set of values that come from our shared humanity. In a sense it doesn’t matter, since, whoever we were, we all came together for a common cause. This brings me to my second occasion. This was in Veryan church in Cornwall at the end of November when the school gathered for their Friday assembly, which they do each week. What struck me was just how at home everyone appeared to be. I remember my time as Reader working with the school and how the church had been an unfamiliar place for most. Not so now: mums, grandmas, toddlers, all happily chatting before the school children arrived. Then the children themselves arrived settling down to something that was part of everyday life. They heard the story of Ruth wonderfully told by the Open the Book team. I was struck by how the story resonates with the refugee crisis. The children listened and then prayed. I went away happy that those children and their parents would have that sense of christian values which would last them through life. Is that enough? Or should we worry that they don’t come to church on Sunday? Part of the answer is perhaps another question, should the rest of us go to church on Friday? What matters is that the church building is being used in a way that works. What kind of a city is Lincoln? The other day I was walking down the High Street and was stopped by two students with recording equipment. They asked if I would agree to be interviewed. On saying yes, they both uttered sighs of relief; it seems I was the first and they had almost given up. Their question was simple. Why had Lincoln been voted a top tourist destination? My response was equally simple. It is s city steeped in history, we have it all from Romans to 19th century engineers, with Gothic Cathedral and Norman Castle to boot. I went on my way slightly embarrassed that I had forgotten Magna Carta. It also set off a train of thought that prompted me to ask the bigger question at the head of this article: what kind of a city are we? Some time ago I was involved in discussions about whether Lincoln should seek to be a World Heritage Site. It would put us firmly on the map and encourage even more visitors. But is that what we are, a city that once was something. We are much more: two universities, a college reaching out across the globe, world class engineering, an arts sector that is getting stronger all the time. All good, but are they what we are? Aren’t they rather, what we do? I then saw on the evening television news that a famine was fast approaching in Ethiopia. I thought, oh no, not again. I would like to say that the ‘not again’ referred to the appalling famine that hit that country in the 1980s. I have to admit that it was rather, oh no, not another crisis seeking help. Whether we like it or not, and indeed we do not like it, humanitarian crises of huge proportions are likely to characterise our world more and more, not least with global warming. It is not only global crises, there are those much closer to home, those in our city without homes, those in need. It was once said that the poor will always be with you. Too true. A little while ago I heard about a world wide movement called Compassionate Cities. This really is a loose collection of cities all around the world that had concluded that what they are is typified by the word compassionate. It links to the local movement slowly emerging here called Compassionate Lincoln. This isn’t yet another organisation seeking to help those in need; there are already many of those. It is more a description of whom we all are. It seeks to draw together the strands of what is already happening to make it more accessible for both those in need and those wishing to help. It came about as a result of the frustration of seeing images of refugees in great need but without any way of helping. The feeling of compassion was there, but not the means to express it in a way that could make a difference. #CompassionateLincoln is a campaign to encourage compassionate, positive and pro-active community-led responses to some of the social challenges that affect our beautiful city and those who call it home. People in Lincoln are compassionate, but to be effective we need to be better joined up. More fundamental though is whether we citizens want to take it one step further and say out-loud to the world who we are? At the end of the day, it is a choice for all of us, citizens of the Lincoln. What sort of a city are we? The job of a charity is to make the world a better place. I have heard this said more than once and it got me thinking. I have supported charities since my teens when I realised just how lucky I was to have a home. I have also worked for some, but I had never really thought of charities having such a big, almost impossible task. Of course the person who said it to me was suggesting that charities can make the world a better place in many tiny ways, not in one huge all encompassing sweep. So, I thought of those charities which we as a family support and have supported, those for which I have worked and others I know. I guess it is true: to a greater or lesser extent charities do indeed seek make the world a better place. My involvement in the arts sector is relatively new, and so I hope I may be forgiven for not knowing that many arts venues and organisations are charities. A good many do indeed call themselves charities, but are they really? Do they really make the world a better place? Or do they just provide entertainment for a select few? After all, all I do is to buy my ticket and attend a performance. What is charitable about that? This matters for all sorts of reasons. All charities, these days, must be able to prove that the provide a public benefit. It is no good making a little bit of the world feel better for a regular audience. The role has to be much bigger. So do they make the world better? There is a good deal of research that suggests that by going to a live performance you do feel better. In early December, the Lincoln Cultural and Arts Partnership is running a seminar on Arts and Happiness to explore this assertion in a local practical context. It is though more than attending a performance. Participating has been shown to improve confidence. Children who perform in one way or another are better prepared for what life has in store for them. Music has been shown to improve a child’s learning in many other areas of the curriculum. Art, music, theatre, poetry, literature all enable us to express feelings or concerns that are difficult to put in plain words. I was talking to a young woman who works with children to explore and overcome their difficulties through drama, and another who, through a spoken word competition, both improves the confidence of participants but also enables them to express what otherwise might stay worryingly inside. This surely is about making the world better. An example I came across a few years ago was about child protection. I didn’t truly grasp the issue until I had seen it portrayed in drama; it opened my eyes. Organisations are challenged by government to reduce obesity, to cut the amount people drink, to eliminate smoking. Endless words can be written, schemes launched, but it might just be that the penny will only truly drop when the issue is presented imaginatively in drama or dance. I don't think this is so far fetched. Art, though, is also much closer to home. It makes us happy. Wouldn’t it be wonderful if it were accessible to all? This, I think is the point. An arts organisation benefits the public if it offers art that will appeal across a broad spectrum, that reaches out to people and groups for whom art is remote and at a price that is affordable to as many people as possible. Thrive is a play about trauma, that of the three teenage friends of one of their number who had died. Zest Theatre who created it are based at Lincoln Drill Hall. It is a wonderful example of how the Drill Hall can be a place that enables young talent to explore, to grow and here to produce great work. I do think that this piece is great art. I came away deeply moved, in the way that I am by King Lear or by Hamlet. I am not saying that Zest are Shakespeare, but here they have caught that most difficult aspect of art - portraying the unsayable. Shakespeare observed life to equip him to write authentically. Zest spent time with a Psychological Consultant in order to understand what children may undergo in such circumstances. I saw evidence that they allowed this understanding to work away in their unconscious minds and re-appear as utterly fresh drama. Too often, the voices that we hear the loudest are those of intolerance, judgement and criticism and it can seem as though our sense of community has been lost. Through #CompassionateLincoln we hope to help people to feel that they can play a really positive role in making our city a supportive, safe and welcoming place to live. On 20th November from 7 to 10 pm, we are holding an event at St. Mary’s Guildhall to celebrate World Hello Day – an international day of community, getting to know your neighbours and extending the hand of friendship. This will be an evening of good food (please bring some food and drink to share), music and conversation and we will also be collecting donations of warm winter clothes which will be donated to a local clothes bank and also to a campaign to support refugees in Lesbos. In my research for my forthcoming book, War on Wheels, on the story of the mechanisation of the army in WW2, I read many accounts of captivity written by those who had spent years as prisoners of war. They were allowed to write home, but in the knowledge that everything they wrote would be seen by their captors. The result was letters that revealed nothing of the dreadful conditions under which they were forced to live. This is perhaps an extreme example, but, in a way, all writers self censor in the light of their audience, but for other reasons too. At the recent Lincoln Book Festival we heard from Andrew Morton how the British press had censored themselves in holding back from reporting a good deal about the abdication crisis. Their motivation was loyalty; nevertheless the effect was to hold back important truths. We then had a panel of journalists considering the whole question of press freedom and censorship. It became clear that, whilst legal guidelines are now quite clear and edicts from government are few and far between, censorship is a current reality. An example would be the rejection by the newspaper of an article because it makes a point that runs counter to the newspaper’s ‘brand’. We perhaps don’t think too much of papers having brands, but they do. There is a distinctive ‘Daily Mail’ brand, a ‘Guardian’ brand. These come into sharp relief at election time when they offer their voting advice. A more blatant form came in the case of Lady Chatterley’s Lover where we heard that, as recently as the 1960s, an attempt was made to withdrawn this great novel from publication as being obscene. There are then myths that become history and so censor other interpretations. We listened to a talk on the Peasants Revolt only to discover that it was not the peasants who revolted but the emerging middle class. Juliet Barker’s painstaking research had turned upside down the assumptions of centuries. She also pointed out to me that we are quite wrong if we trace a line from Magna Carta to the Peasants Revolt; it is more closely linked in terms of documents with the Doomsday Book and was about the interaction of freedom and money. Our speaker for the children’s afternoon on Magna Carta pointed out just how often freedom is evidenced by people’s ability to deal freely with their own money. There are also accepted truths which censor other opinions. The Friday evening of the festival gave the audience the opportunity to dispel some myths about Islam and to understand better its origin and the way that it fitted with other contemporary religions. The way Islam is reported is often to emphasise extremes. We heard of a faith that could hardly be more different, whose teaching builds on the Hebrew Bible and parallels much of Christianity. Yet, this is seldom if ever reported. It is hardly surprising perhaps that young Muslims become disenchanted. If I look ahead, I wonder how the press will approach the European Referendum and whether both sides of the argument will receive a fair hearing. The sort of censorship I have been talking about is perhaps inevitable in a free society. We just need to be aware of it. Having said this, we do in this country have a long and proud tradition of public service broadcasting. Perhaps one area for the new BBC charter would be a renewed commitment to give due space to views from across the spectrum. ‘I suppose we should take some refugees’. How many times have you heard that said with a heavy heart? We disagreed. #CompassionateLincoln is a campaign to give confidence to the compassionate, to demonstrate the power of community, to encourage community-led action and to recognize that we all have a role to play in making our city a great place to live. Nearly one hundred people gathered in Lincoln Drill Hall in the early evening of 26 September responding to a call by a small group of people who had met earlier in the month frustrated by having no way to respond to the refugee crisis. Everyone had seen the dreadful images on their televisions of people, just like us, fleeing terror in their home country. The purpose of the gathering was to find out how ordinary people can offer welcome to the refugees who will be coming to the city over the coming months. It was not a debate over the pros and cons, but rather an opportunity to try to understand what being a refugee actually means and what we can do. Ric Metcalfe, leader of the City Council, gave us the stark statistics of the scale of the disaster in Syria and the plans already put in place by central government and local authorities for dealing with some of the practical aspects of the arrivals. He told us that those coming would be those in greatest need. It was this aspect that people focused on. First though we heard about what was already happening, and there is a lot. There has already been one collection of clothing which has now been sent out to Croatia where many refugees will soon be experiencing colder weather. There will be more. But we also heard about churches making houses available for local homeless people. This was an important reminder that it is not just refugees who are in need; there are many already here. It is not just about numbers of people moving from a house in Syria to a house in Lincoln. It is about individuals fleeing their home and seeking a new home elsewhere. This led us to think about what a home, as opposed to a house, actually is. It is a place to be safe. It is a place that is familiar. It is a place where people can grow and fulfil their potential as human beings. We forget that in refugee camps life stops, education stops, a whole generation can be denied the opportunity for growth, just because they were born in the wrong place at the wrong time. So as well as physical support, refugees coming to the city will need friends to show them the ropes: where to shop, where to access health care, where to worship. The priest of the Orthodox church on Burton road told something of the oppression their sisters churches face in Syria but also of the welcome they can offer here. There were other things. The provision of language support, Lincoln people learning about Syrian culture, Syrian food. Most of us were fortunate enough to be born in the right place at the right time and so have the ability to share out good fortune with others. Talk without action is pointless. So everyone present offered ideas on what was needed and what could be done, and, most importantly, what they could do. The City Council also took away an action list. Lincoln has a proud tradition of welcoming refugees stretching back many decades. This is an open group to which all are welcome. There is a Facebook page https://www.facebook.com/compassionatelincoln where readers can find out more about what is planned and join in with their ideas. I would say that everyone went away feeling that bit closer to being able to help these desperate people both coming from Syria and those closer to our home. This summer of Lincoln Festivals: how has it been for you? April seems a distant memory with that first chance to see the new home of Magna Carta and the breathtaking castle wall walk which has since attracted record numbers of visitors. Then June and the Magna Carta weekend; July and Jools Holland in the Castle; Jesus Christ Superstar in the Cathedral. But then other festivals: the Chamber Music Festival visiting different parts of the county with world class music; the Film society programme with its Magna Carta flavour. What a summer! By the end of August I truly thought I was ‘festivaled out’, certainly ‘Magna Carta’d out’; but then came David Starkey at the Drill Hall as part of Festival 800. The controversial Question Time panelist put on his history hat and drew a vibrant picture of the politics of Magna Carta with modern day references and resonance. Billy Bragg and the Levellers provided music and Hillel Steiner much food for thought on human rights and migration. An old friend, who runs one of the famous Lincoln restaurants, told me that her daughter, returning this summer from a time away, had noticed a much stronger cultural vibe in the city. Another friend said how he used always to go to Edinburgh for their festival and this year hadn’t, but hadn’t needed to since there were so many quality events in Lincoln on his doorstep. Yet there is more to come. I admit it. I love history, so much so that I am now spending my time writing it. The Lincoln Book Festival at the end of September has, as it says in its blurb, ‘History at its heart’. It is after all held in a city where over two thousand years of history seep from every stone. This year’s festival has very nearly the same time span, running as it does from an exploration of Islam, through a snapshot of the women of Lincolnshire in the 13th century, through ages of revolution, to previously unpublished material surrounding the abdication crisis and up to the 21st century’s wrestles with press freedom. We then have, in true Monty Python fashion, something completely different: Frequency. You know the one that ‘other people seem to like, not really my thing’. A few weeks ago I had a conversation with one of the organisers and this helped me understand it better. It’s not loud, atonal music; it is far more subtle. It is all about the digital age we now live in, and we do, all of us even if we don’t do ‘Facebook’. News broadcasts carry images taken by ordinary people on their phones; everything is more immediate; we can all have our say. The Frequency Festival explores what this means in our lives and uses digital technology to complement the more traditional art forms. This year’s Festival has as its theme: Liberation. I asked what were the events for those of us new to it all. She listed them: ‘Cosmic Birds’ a quiet, meditative, kinetic piece playing with light at Chad Varah House; ‘Enlightenment’ at Waterside Shopping Centre; 'The One The Few The Many’ - an installation piece is going into Cobb Hall at Lincoln Castle, representing Lincoln’s history and its future; and Through the Fourth Wall’ - a magical, theatrical, projection piece in the Roman Postern Gate site. I would add at the Drill Hall, Compagnia TPO: Bleu, a combination of ‘sumptuous visual imagery, movement, dance and music’. When it is all over please let me know what you thought of it all. It was all over; for many it had been over since 8 May when Victory in Europe was declared. I remember being in a tiny church in the Vale of Belvoir in Leicestershire in May 2005 and talking about Victory in Europe in the sermon I preached. After the service, when most people had left, I asked the churchwarden for his memories of VE Day. ‘We had no idea it had happened.’ He went on to tell me that he had been a prisoner of war in Japan and he and those who had survived with him had spent their years oblivious to anything that was happening outside their camp, unless the camp commander chose to tell them. For the last year I have been researching a book, War on Wheels, about the mechanisation of the Army in WW2. It is about the many thousand soldiers, ATS and civilians who worked in the Royal Army Ordnance Corps, my father’s Corps, and who were responsible for giving the army its wheels. As part of this I looked hard at the war in the Far East. My researches took me to the archives of the Imperial War Museum where I read accounts of the fall and surrender of Singapore and Hong Kong and then the first hand accounts of some of those Ordnance men who survived their imprisonment. I remember sitting at the desk holding the typed and handwritten sheets of paper telling of just what human beings are capable of doing to each other. It was a sacred experience. I decided that these accounts must be in my book both to honour those men but also to offer to my readers a whole picture, warts and all. It made me think hard about whether I should change my mind and, in the interests of reconciliation, remove the offending passages. I have decided to leave them in. It is, for good or ill, part of the horror of war. I have said more than once that politicians and others sadly need reminding of these horrors before they send our young men and women to fight. We have moved on, but I believe we must remember, I think, for two reasons. Firstly, for those men and women who gave up their lives and endured so much for our sake. Those I have read about weren’t soldiers by choice. Many were store-men or mechanics or clerks. They were caught up in a maelstrom; they had been in the wrong place at the wrong time. They conducted themselves with enormous bravery and dignity. We must never forget them. The second reason is that it was, as I said earlier, human beings doing unspeakable things to other human beings. We see reminders every day that this is not a thing of the past. If we stand up against anything, surely it must be this. Would one super festival be a better stage for Lincoln's talents? The Lincoln year is punctuated by festivals of one kind or another; my question is whether we might be better served were they brought together in one - say - two week period in the summer? This could be put another way, would a single Lincoln Festival be a greater attraction for our visitors? The Festivals in the Lincoln calendar, for example the Book Festival, The Chamber Music Festival and Frequency, are well supported, of good quality and greatly enjoyed. This year a number of different events are being brought together around the Magna Carta weekend and the Magna Carta celebrations more generally. These embrace film and beer as well as street entertainment and offerings for big outdoor audiences at the Castle. The Drill Hall plays its part in the existing festivals and also in the Magna Carta events. For the weekend itself, we act as ‘book ends’ with dance at the beginning and music at the end, and quite a bit in the middle as well. The Dance, a piece entitled Refugees of the Septic Heart from Tom Dale productions, is a great example of how to offer an alternative view. In the early discussion about the commemorations of the 800th anniversary of the sealing of Magna Carta, I became worried that it might focus too much on the historical event or just attract ‘establishment’ celebrations. Tom Dale’s piece is distinctly alternative, it questions established values, in many ways it does what the founding fathers of America believed Magna Carta did; it stands up to those who seek to exercise power. Specifically it explores how the power of money is abused. It does this with dance but also with digital imagery and music. It is a first for Lincoln and one to be proud of since, having been a hit at the Edinburgh fringe, the production will next be performed in Hong Kong. The music at the end of the Magna Carta weekend is quite different and will be the result of Sinfonia Viva working with local schools and the creative efforts of the children. 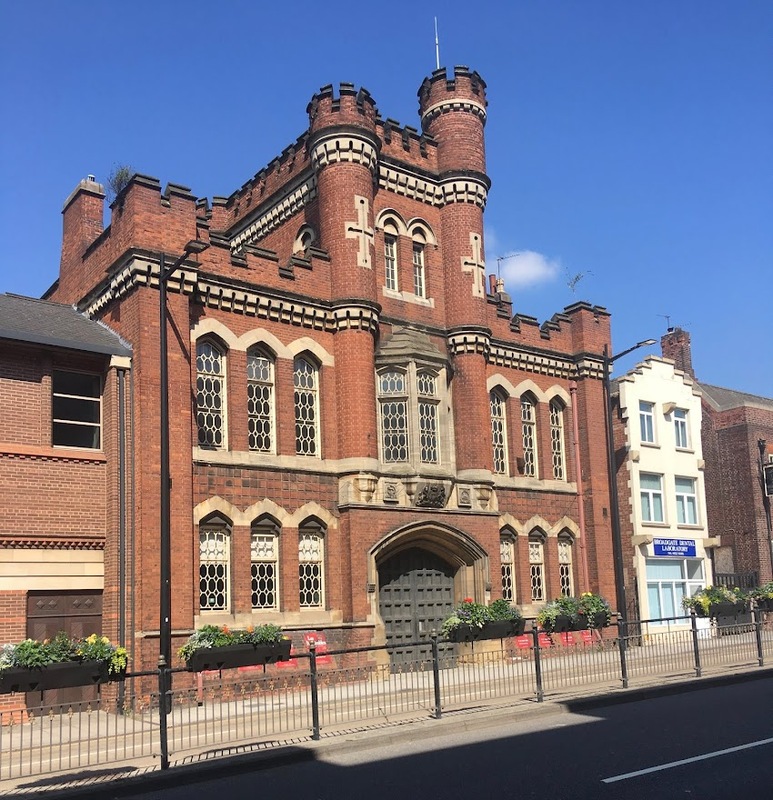 These two events demonstrate something of what the Drill Hall is about, giving space to new and adventurous work and being a place where Lincoln people can participate in performance. 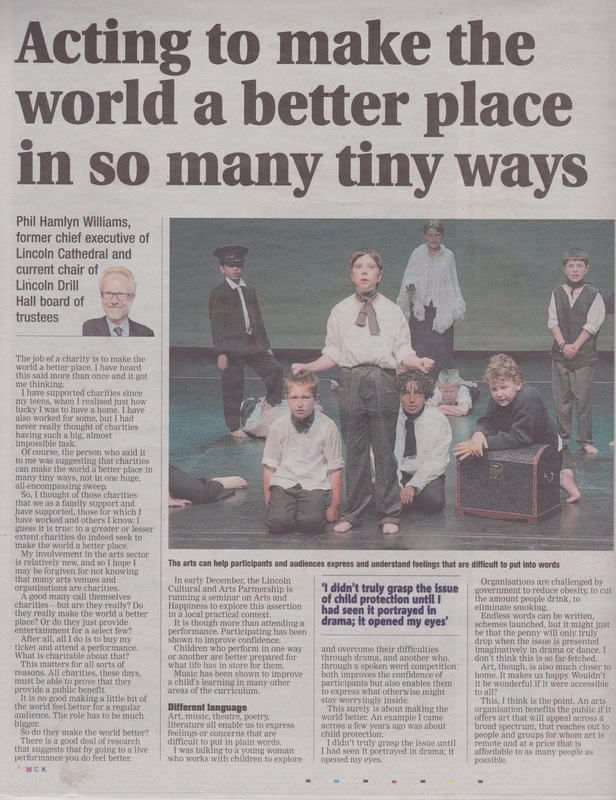 Of course the Drill Hall is about more than this; its role is to be there for a whole range of Lincoln communities and offer, perhaps not something for everyone, but certainly a variety of performance that will be enjoyed by most. So, back to the question of the Festival, do we want a big Lincoln Festival? It would give audiences the chance to experience a number of different forms of performance: theatre, film, dance, music and literature. It could be built round a theme, as the Magna Carta weekend is. It could say something about what is special about Lincoln: a vibrant modern city in an historical setting. Importantly, it could give space for home grown talent to perform. Well, perhaps the Magna Carta weekend will be a good taster. My instinct is that we will want a bit of both. Certainly something big that brings the city together and offers a broad spectrum of events, but also focussed festivals at other times of the year. We could take a leaf from Cheltenham’s book and drawn them together as The Lincoln Festivals. It could so easily have been lost. For ten short weeks in the summer of 1215, a charter carrying King John’s seal tied his hands. He hated it with a passion; it was outrageous that the King’s power should be limited, that he should be answerable to his barons. The hate was so strong that he went cap in hand to the Pope to have it annulled, to be as if it had never happened. The charter, on a single sheet of parchment which now sits in Lincoln Castle, was probably written out by the clerk to the Bishop of Lincoln, an office, the modern equivalent of which, I held from 1996 to 2003. In September 1215 the charter had become worthless and so I guess many Bishops’ clerks, for copies of the charter had been made for all Bishops, would just have discarded them. The clerk to the Bishop of Lincoln didn’t. The charter would have taken a great deal of careful writing out - some 3,500 perfectly crafted words. The clerk, though, may well have studied at the medieval ‘University’ of Lincoln, then based at Lincoln Cathedral and by many accounts as well regarded as Oxford or Cambridge. He would have been following in the footsteps of another clerk, Stephen Langton, who there studied books about the power of Kings and who later, as Archbishop of Canterbury, had a big influence over the drafting of the charter. In the 12th century power was the hot topic; people from all parts of Europe were asking questions about power: how to stop it being abused, how to limit it, how to make the powerful accountable. The books Langton may have studied are still in the Cathedral Library. So the clerk to the Bishop of Lincoln would have known that the annulled charter was truly important and must at all costs be kept. Only two years later after John’s death at Newark, his infant son, then King Henry III, re-issued the charter alongside a smaller charter limiting his powers over the great forests of England. The 1215 charter, because it was bigger, became known as Magna Carta, and the smaller as The Charter of the Forest. Lincoln Castle is the only place where they can be seen together. Magna Carta was re-issued in 1225 and then in 1297. It became the foundation of limits on the power of the King. The short film you will see at Lincoln Castle traces the influence of Magna Carta through the Peasants Revolt of 1381, to King James I who asserted that he was King by Divine Right, to the Bill of Rights of 1689 when William and Mary came to the throne at Parliament’s invitation, right through to the growth of parliamentary democracy. In America and elsewhere Magna Carta was taken into the heart of their constitutions as standing up to the power of Kings. It is still quoted in American courts. You will see Magna Carta in a darkened room; there is a sense of awe. Absolutely right! 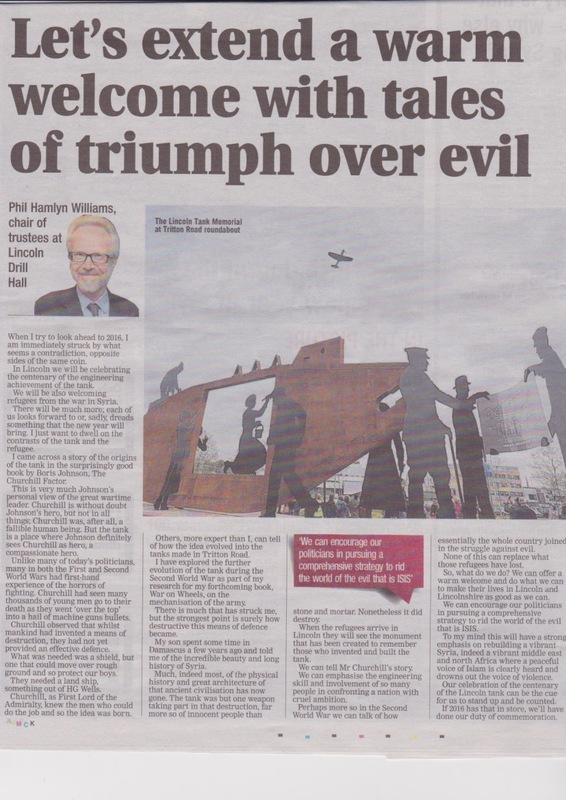 The Lincolnshire Echo of 30 April 2015 published the following piece I wrote for them. Is it just me, or is it really difficult to extract myself from my armchair and the evening’s television and actually go out? A year ago, as I write this, I was Chief Executive at Lincoln Cathedral, a job not without its demands and certainly, if I did go out, it wouldn’t be often and would probably be to the big cathedral concerts. I shall probably never forget the standing ovation that met the cathedral choir’s performance of Messiah in 2012, or indeed The Halle and Vaughan Williams Pastoral Symphony. What I didn’t realise was how much else there was around, how different it was and how brilliant it is. Last summer as I was beginning work on my book, a friend showed me an advertisement sent out by the Drill Hall for a new chair of trustees. I didn’t think too much about it. Over the weeks ideas would come into my mind and I began to think, ‘I could do that!’ So, I applied, was interviewed and then appointed about six months ago. In the meantime I had been to two quite different performances. Literature at Lunchtime with Dr Jane Mackay, and Hamlet. I knew Dr Mackay from my time working in Leicester. It was familiar, rich in content and thoroughly enjoyable. Then Hamlet. One of my favourite plays, but one I had only seen at the Old Vic with top line actors. What would it be like? It was billed as ‘abbreviated’ and ‘different’. Not many people were there. Had I made a mistake? Not at all, this was a production of great energy that got to the heart of Shakespeare’s play. I was taken by surprise. I then attended The Last Post, surely Lincoln at its best: a true community effort that told a Lincoln story well and to great effect. A great deal of hard work, I know, but I hope for more. My granddaughters’ faces at the pantomime said it all. But then came the question, ‘but is it art?’ Of course, it’s art; it takes immense skill in writing and acting to keep children, and adults, engaged for that length of time. So far, so good. There were then three performances that I would never have gone to had I not ‘been on duty’. Broke, a play about the burden of debt; Circus Geeks, a show by jugglers and Sinfonia Viva with a programme of well known music. One of the joys of live performance is that you are in the same space. There can be eye contact. It won’t and indeed can’t be the same each time. The audience may applaud at the wrong time, a piece may find a whole new energy; things may go wrong. I think that more than anything the energy of performance is contagious, perhaps especially in a relatively small space. This energy doesn’t evaporate, I come away with a bounce in my walk and a brain positively buzzing. Lincoln is greatly blessed by live performance. Of course, it isn’t just the Drill Hall. LPAC has a great programme. It is working with the Drill Hall over Easter with the Eastival Festival for families with young children. The cathedral puts on large concerts with great professionalism. The newly opened Castle has an exciting programme over the summer. The Collection offers much; for me the Book Festival in September will be the highlight. The Lincolnshire One Venues offer programmes of professional work alongside that locally produced, and a great deal for children and young people right across the county. The Magna Carta weekend in June will see the Lincoln based venues coming together for a weekend of huge variety. I’m going to get out more, how about you? Magna Carta has been taken to the heart of freedom loving people across the globe. Most recently the UK Supreme Court decided in favour of the publication of letters by Prince Charles written to ministers. Whatever the merits of the letters themselves, it was a timely reminder that no one is above the law. This is the essence of what Magna Carta has come to be about. It seeks to control the way in which power is exercised by those who hold it. I recently read a wonderful little book by the former Archbishop of Canterbury, Rowan Williams, on St Mark’s gospel in which he argues that Jesus was the victim of abused power. Good Friday is the day the Christian Church remembers the execution of Jesus at the hands of the Roman authorities. He was a man who could have so easily stirred up trouble and so history sees Pilate, the Roman governor, as pragmatically justified in what he did. Take a step back though, and power is there abused time after time. A man is ratted on by one of his mates who had been put up to it by envious men in authority. Once in the hands of these men, it is the world gone mad. The accusers can’t even lie consistently. The man is caught in a nightmare; the judge is the accuser and so the only certainty is that he will be condemned. I remember a TV play some years ago with the wonderful Richard Griffiths playing William Beausire a British stockbroker with dual British and Chilean nationality, abducted while in transit in Buenos Aires airport in November 1974. He is taken to a torture centre in Chile and never seen since. He was among the list of people deemed disappeared under the Pinochet regime. He was an innocent bystander. Today this is the pattern of life for many powerless people in countries like Mexico; they are at the mercy of the gangs who weald power. Back to the events in Jerusalem two millennia ago, the religious authorities hand the man over to the secular governor who finds himself caught in the erie space between right and wrong. He seems to know that the man is innocent of any offence, but he is equally clear that forces are bubbling way underneath the surface sufficiently vigorously for him to be certain of trouble. He is desperate to be let of the hook, to be saved from choosing between right and chaos. He hands the man, or rather his destiny, to the crowd who are up for anything having be whipped into a frenzy by the religious men. The crowd demands crucifixion. The man is doomed. The crowd disperse. False accusation, men giving way to pressure, the innocent caught in a world of madness where right has been blown out of the window; is this an inevitable part of being human? It works its way up from a seemingly unimportant abuse perhaps in the workplace to those falsely accused and executed. It matters. The Guardian on 28 February 2015 published an article by David Davis MP, former shadow Home Secretary and champion of freedom. His critique was of the security services and their unwillingness to bring to justice those who threaten our democracy through terror. This struck a chord with the comments on Mr Davis made by historian Dr David Starkey in his excellent one hour TV programme on Magna Carta broadcast on the BBC in February 2015. Dr Starkey reminded the viewer that Davis has resigned over the issue of detention without trial. Davis sets a brave and difficult challenge. We want to be safe from terror, but this must be within the rule of law and not outside it. In the same edition of the Guardian, Polly Toynbee invites readers to become Members of the Guardian to safeguard its independence. This has to be right. It is vital that a newspaper like the Guardian should be free to give space to a Conservative like Davis. I hope that an influential membership will never have power to call the shots over and against the editor. Broke is a play by the very talented Paper Birds. It was very well received at the Edinburgh Fringe, I was lucky enough to see it at Lincoln Drill Hall. It explores debt, how it builds and then its legacy. The writers saw a point of origin in the 1980's with Mrs Thatcher's attack on working communities and her encouragement to everyone to become middle class. It is middle class aspiration where the driver for ever increasing borrowing can be found. They explore individual and government debt side by side. It is frightening just how easy it is for someone, making their way through life, to gather around them the millstone of debt, and even more chilling to see just how hard it is to get out. Perhaps more scary is their analysis of government and how a consumer economy can only function with ever increasing debt. It is the emperor's new clothes, it only works until some is brave enough to blow the whistle. For me, the play brought back ideas contained in my blogs from 2009 when I was writing Broken Bonds, a novel about the banking crisis and its impact. My more recent blogs are about Magna Carta and the abuse of power. I wonder, was Mrs Thatcher's push for deregulation, which I still see as the heart of the problem, an almighty abuse of power? The Reform Bill was introduced to Parliament in 1831, the year my grandfather, Alfred Hamlyn Williams, was born. When the Bill became an Act of Parliament it began the process of injecting a note of realism into parliamentary democracy which has continued through the emancipation of women to the universal franchise we enjoy, or are supposed to enjoy, today. In May of 2015 there will be another test of this enjoyment when we will see just how many of those eligible actually vote in the general election. There is a disconnect between the paper and the practice. Disconnection can be traced back to the document which many assert is the bedrock of democracy, Magna Carta. In 2015 we celebrate the 800th anniversary of the sealing by King John of this charter of some 3,500 words written in medieval Latin, which, but for the serendipity of history, may have been forgotten. Claire Brey, the curator of the forthcoming Magna Carta exhibition at the British Library, told Dr David Starkey, in his excellent TV programme on Magna Carta, about the phone calls she receives on a fairly regular basis from members of the public who think they have been treated unfairly, asking how they might quote Magna Carta in the particular argument they are having. Of course she has to reply that it probably can’t help, nevertheless the complainants are right in seeing this ancient document representing fairness in the face of oppression. The story of the big charter, as opposed to the smaller charter of the forrest, was all about English Barons seeking to temper the excessive demands, mainly for money, of their king, John. The story continues that, no sooner had it been sealed, King John ran to the Pope to have it annulled. On 5 February 2015 the House of Lords staged an exhibition of the four remaining engrossments of Magna Carta which they placed alongside the Reform Act and the 1629 Petition of Right. I was lucky enough to be invited to the exhibition and I was struck in a number of quite different ways. The four engrossments look different, but David Carpenter, in his new book Magna Carta, assures us that their wording is almost identical. The manuscripts are written in tiny neat letters and I couldn't help thinking of the painstaking care that the clerks must have taken in producing their art, for art it is. I was then drawn to the thinking by Archbishop Langton and others, painstakingly built over many years, which arrived at the view of kingship and the exercise of power that Magna Carta expresses. These ideas were hedged in by a great deal of detail about the particular arguments of the Barons, but at its heart there was a delicate green shoot of how societies should function. My wonder is how it survived. Magna Carta was reissued and revised many times in the thirteenth century and finally ‘became law’ in 1297, although some will argue that, with legal ‘time’ beginning only in 1189, Magna Carta was itself an iteration of Common Law. The Parliament exhibition of the Petition of Right was the next stop on the journey. This was again an argument about kingship. The Stuarts sought to assert that they were kings by divine right. The Petition of Right, challenged this and it was further and significantly tempered by the Bill of Rights of 1689 under which William and Mary came to the British throne. With the work of the great seventeenth the century lawyer, Sir Edward Coke, we move across the Atlantic and see Magna Carta quoted in the foundation documents of many States and indeed in the US Constitution itself. I was lucky enough to attend the academic symposium run alongside the exhibition of Magna Carta at the Library of Congress in Washington. The exhibition pointed with great clarity to the way Magna Carta has been viewed in the US over two centuries rather than getting bogged down too much in its origins. For the founding fathers, there was no doubt that bad King John was then bad King George. In the USA, the power of the President is tempered by the Constitution; in Britain the power of the Government is tempered by Parliament. This is where disconnection comes, since in reality President Obama has his power tempered, not by the Constitution, but by Congress with the effect of stalemate. Prime Minister Cameron has his power tempered, not by Parliament, by his fear of non re-election by a minority of electors. But it is more than this, as David Starkey pointed out, both governments ignore the core principles of Magna Carta with their assertion of the right to imprison terrorist suspects without trial. In her insightful short radio programme, Helena Kennedy took a slightly tangential view and saw governmental power tempered by corporations which outmuscle most nation states, principally the massive financial institutions and internet providers. So, where does this leave us? In this country, with an urgent need for all electors to use their vote in putting pressure on government to adhere to Magna Carta but as importantly stand up to the shadowy corporate King Johns of the 21st century. What has Magna Carta to do with me? Someone wrote to me last year complaining about all the fuss being made about Magna Carta; surely there are more important things? It makes you wonder. In 1213 it was a group of wealthy barons, not top of most people’s list for sympathy, who were crying ‘unfair’; the remainder of the population might well have been too, but no-one heard them, or bothered to write down what they said. The barons’ many complaints were legitimate; we would recoil at the thought of a widow being at the mercy of the king. The core of the complaint was as it so often has been over the centuries: money; the king needed it and the barons had it, and the king used, or rather abused his power to obtain it. Was King John then a uniquely bad king? Opinions differ, the issue was rather more what kingship meant and this is where Lincolnshire’s Archbishop Stephen Langton comes onto the stage. It seems that Langton had thought long and hard about kingship. He had a huge resource to inform his thinking: the biblical book of Kings and a particular commentary on it which is still among the Cathedral medieval manuscripts. The ancient Jews had agonised for generations over whether or not to have a king and, if they had one, just how would he fit between them and God? The thinking set the ground rules and from the start the king was not an absolute ruler. Langton took this thinking and brought it into a debate with a family of kings who clearly saw their power as absolute. It is many years since monarchs saw their power as absolute, or is it? 21st century ‘monarchs’ tend not to be kings; most are individuals or groups who wield power given to them through a demographic process or taken by them through all kinds of violence. There others: organs of government, some of those who control the media and digital technologies, those who take massive risks in banking; the list goes on. The Magna Carta question is about the boundaries to be placed on their power. Power is a fact of life, but power must be exercised responsibly, fairly and within the rule of law. Parliamentary democracy followed on quite quickly after Magna Carta with the De Montfort parliament in 1265, itself greatly influenced by another man of Lincolnshire Robert Grosseteste. It is and always has been Parliament that wrestles with the boundaries of power and all too often it is a complex and uneven fight. The whole question of surveillance is a very clear illustration. So does Magna Carta matter? You bet is does. What child has never said, ‘it’s unfair’? How often is it truly unfair? How often do the powerful simply get away with it? Magna Carta is the weapon; society simply needs the bravery and determination of the barons to give it true voice.